The great Gene Anderson, original founding member of the famous Anderson family in wrestling, was never known for his singles competition. 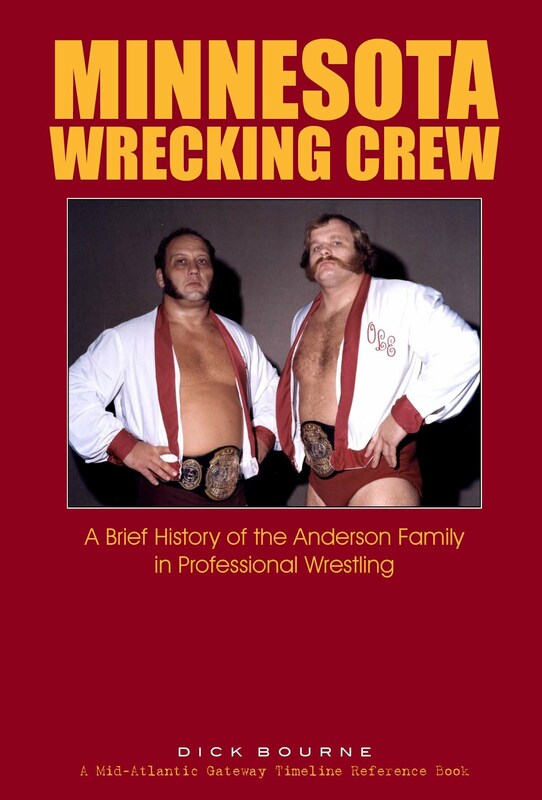 He was primarily known for being part of a famous tag team known as the Minnesota Wrecking Crew with two different worked-brothers: Lars Anderson in the 1960s and Ole Anderson in the late 1960s through the early 1980s. The Andersons were no strangers to tag team championships. 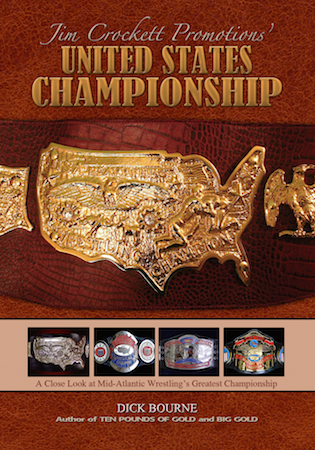 They held multiple regional and world championships over several decades. 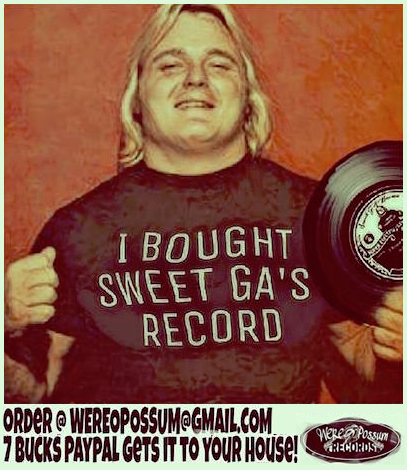 But it was somewhat of a rare occurrence when Gene Anderson received a shot at the NWA World heavyweight singles title. He received a few in the early 1970s against champion Dory Funk, Jr., in towns like Norfolk, Richmond, and Raleigh for promoter Joe Murnick, who more than others apparently saw value in putting Gene in the ring on top with Funk. 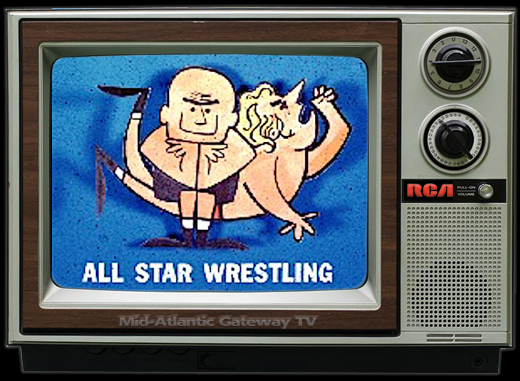 And then suddenly, almost exactly 10 years after his last NWA title shot on July 7, 1971, Gene gets one last shot at the title again, this time against new champion (and long time rival in the tag team wars) Dusty Rhodes on July 11, 1981 in Spartanburg, SC. Admittedly, on the surface the booking of this match doesn't make a whole lot of sense. Throughout his career, Gene was predominantly a tag team wrestler and never was in the mix for singles titles. 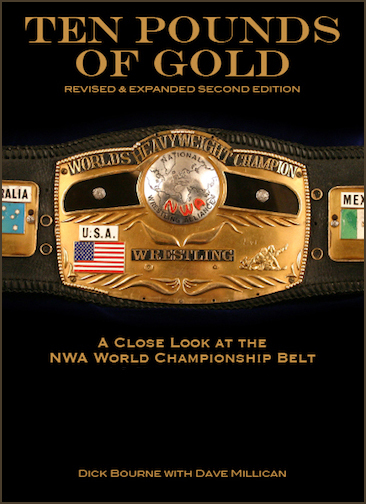 Ole as an challenger for Rhodes made more sense, and indeed Ole was getting several shots at the NWA title during this time. 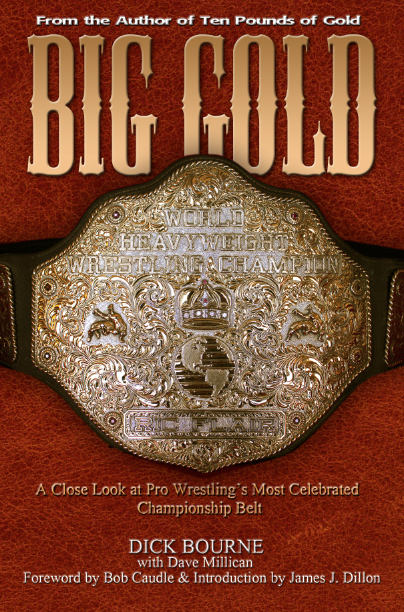 Ole had the long running singles feud with Dusty, particularly in the Georgia Championship Wrestling area. He could also deliver a better promo to promote the match. This Spartanburg card was a matinee show at 3:00 PM. Ole is not listed on it, so it's likely he was booked on another spot show town on a matinee card. 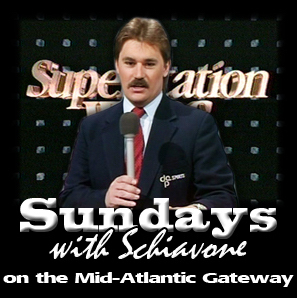 I've not been able to find a record of any such show at this point. 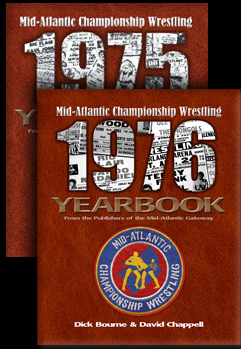 Both Ole and Gene reunited later that same evening in Charlotte for a defense of their NWA World tag team championship against Ricky Steamboat and Bad Bad Leroy Brown. 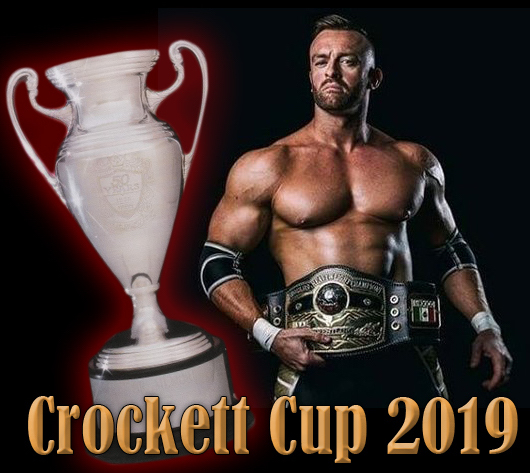 Rhodes and the NWA title weren't on that Charlotte show, so it's safe to assume Rhodes defended the title in some other Crockett town that Saturday night, but I've not yet come across any record of a title defense for Rhodes that night. 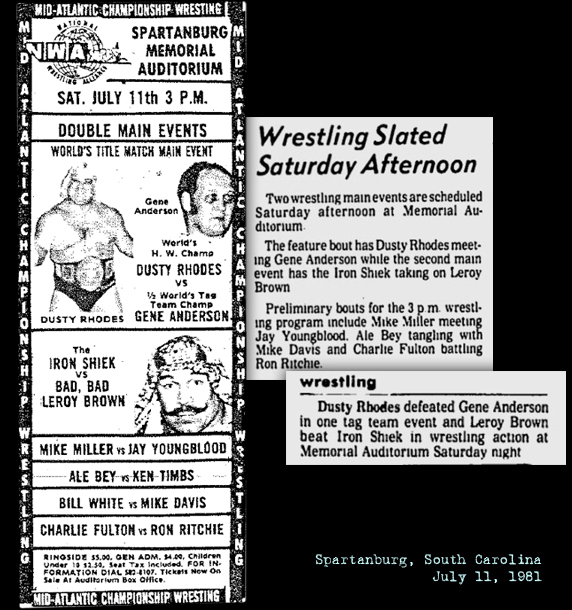 The Spartanburg newspaper reported the following day that Rhodes had defeated Anderson in the main event. 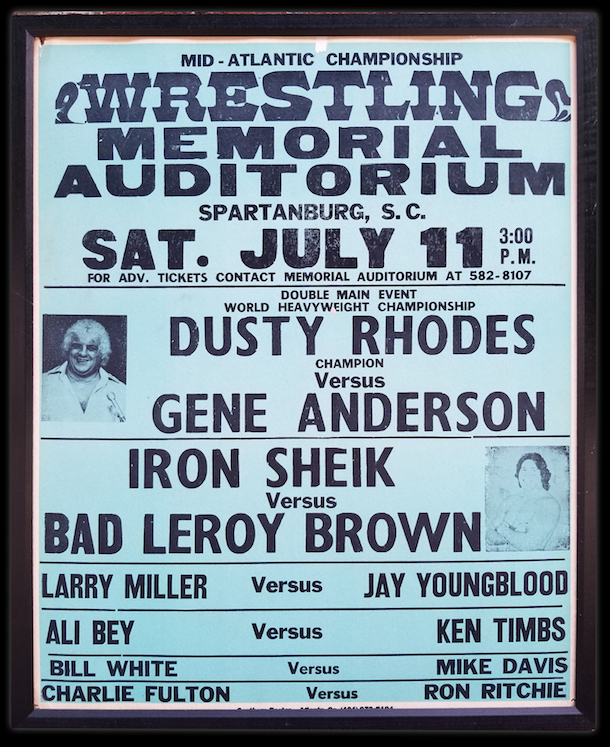 In other action on that 7/11 Spartanburg card, Bad Bad Leroy Brown defeated the Iron Sheik. No other results were listed. 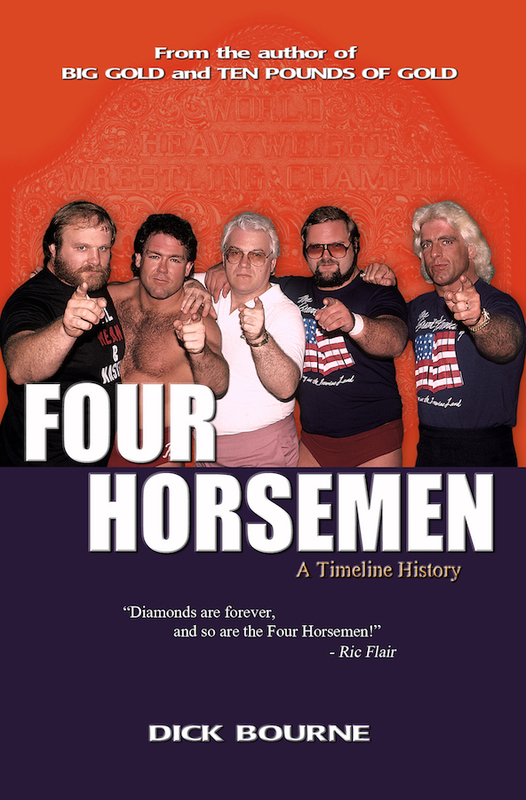 This would be Gene's last shot at the NWA championship. He never got another shot after that, at least none that we have ever come across. (As always, we welcome additional information.) 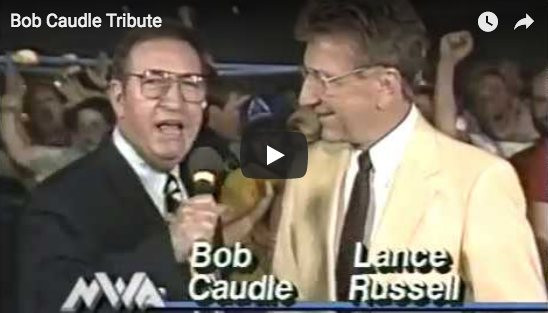 He and Ole were also in their final run as NWA World tag team champions. I kind of like knowing this one last, odd singles title shot was against Dusty Rhodes, who had a long and storied rivalry and feud with the Andersons. If you've hung around the Mid-Atlantic Gateway for very long, you know we are big fans of the Anderson Brothers. This is a nice little rare piece of Anderson lore to hang on to. 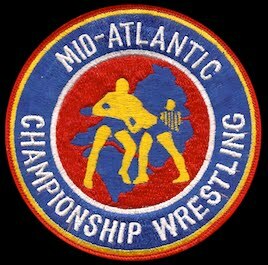 This "Classic Poster" post was edited from an original post on the mid-Atlantic Gateway back on July 19, 2017. Thanks as always to Mark Easteridge for the newspaper clippings and Brack Beasley for the photo of the poster.